Some years back while living in Pasadena, I became familiar with the multitude of wonderful homes in the area and among them The Gamble House, by the Brothers Greene. 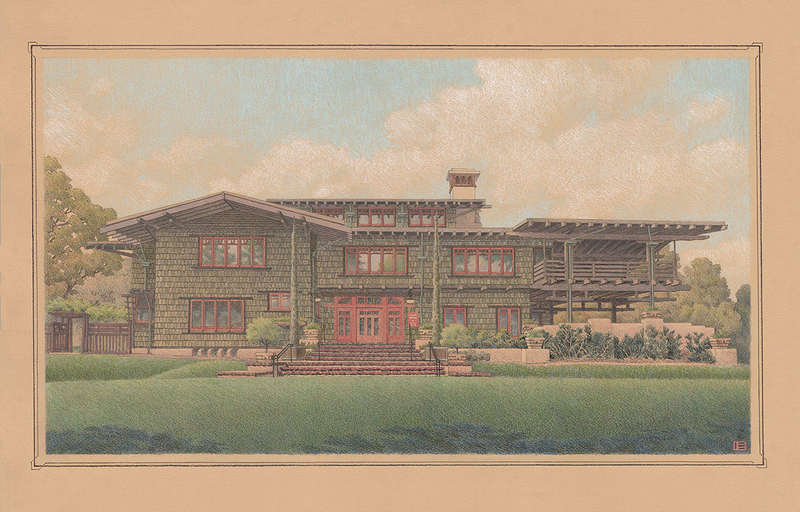 At some point, the idea of rendering this building began to intrigue me and how I would depict this craftsman masterpiece as an architectural illustration project. Having some holiday time off in December, I decided to have a go at it- a poster type illustration of the majestic front elevation. The South facing facade is visible to anyone driving down Orange Grove Avenue, and although there are any number view of interesting view angles, I went for “iconic”. An interesting rendering problem in this case was the deep shadow cast by the eaves for most of the day (also making decent reference photos a challenge) and I chose to play down the shadow in order to present the subtle architectural detail usually obscured in darkness. In homage to the Beaux Arts style, I rendered it on a beige colored stock, which infuses the overall drawing with warmth and richness. This pencil drawing was meant to serve as a template for a more formal watercolor rendering – on the back burner for a while due to other projects – but who knows, maybe next Christmas!